Yesterday I met up with a friend at the Harp, an excellent recent discovery, before we went along to the big David Bailey show at the National Portrait Gallery. The show runs until early June, so if you find yourself in central London there’s plenty of time to nip in and see it. Just be prepared for crowds. After all, has any other name been as synonymous with British photography as Bailey? While you’ll have seen many of the portraits before and no probably not find too many many surprises, it’s rare to see quite so many of Bailey’s prints in one place. You can see the range of the show from how many rooms were dedicated to it, though I wasn’t sure I cared much for the four sets of reportage – Sudan, Naga tribes, Australian aboriginals, Delhi – or for the other non-studio projects. Usually I’d favour these, as for me photography is about hunting for a picture rather than constructing it in the studio, but I didn’t feel one’s appreciation of Bailey was improved by including them. Of course, there are plenty of the instantly-recognisable Bailey studio portraits – the high contrast front-lit, black clothes, bleached background style that made his name and powered a 50+ year career. In fact there are so many that you imagine his clients would surely have been disappointed had Bailey not anointed them with that Kray-like black and white glamour. 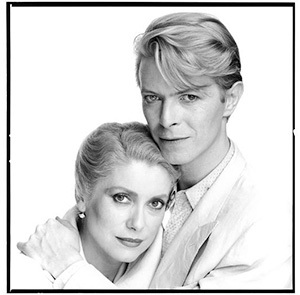 Yet my favourite (by far) had to be this 1982 shot of Catherine Deneuve and David Bowie which seemed almost recognisable as a Bailey – but with a subtle progression. Two things really struck us. One was that there seemed to be a lot of prints which had taken the standard Bailey-look much too far and had ended up looking rather crude. Little more than “chalk and charcoal”, these prints just lacked the tonal richness and variety that made other images so successful. 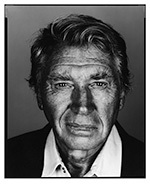 The other worry was the number of portraits where the skin tones had been rendered to make the sitter look as if he had spent far too much time baking under the Florida sun, as in this picture of Don McCullin (yes, that is him). A blue lens filter can certainly be valuable in B&W portraiture, exaggerate skin features and perhaps revealing character, but I’m not sure pictures like this really merited being in the retrospective. Interesting but unsuccessful experiments? Of course, that’s just my opinion, yet it was shared by my friend, a highly respected photographer who also made his name in the 1960s. It certainly didn’t affect my enjoyment of the show, and I certainly recommend starting – and perhaps finishing – in the nearby Harp. Also listen to two related radio programmes here.